The Bedford Park Festival raises money for local charities and the work of St Michael and All Angels, with the active support of the community and dozens of local businesses. If you would like to get involved, please contact the Parish Office on 020 8994 1380 for more information. 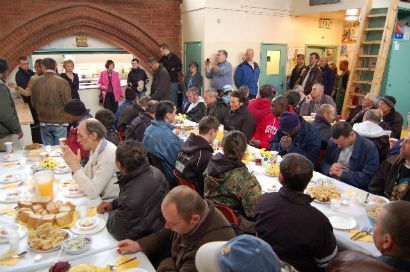 The Upper Room is a local charity based in W12 and working with the homeless, with economic migrants and with ex-offenders. It aims to give them the self confidence and support they need to become economically independent. At the heart of the Upper Room is its meal service which provides nutritious evening meals five days a week. Free toiletries, bedding and clothing are also offered when available. Additionally help is on hand for onward referrals for health, housing and benefits advice. In addition to the meal service, the Upper Room has two other projects. UR4Driving offers ex-offenders the chance to obtain a driving licence, making it easier to get work in the distribution industry, and reducing the risk of re-offending. To qualify for this potential participants must commit to 80 hours of voluntary work, giving them experience of helping others while being helped themselves. The homeless and unemployed, especially those from Central and Eastern Europe, can join a multilingual and personalised programme of support – UR4Jobs - to help them with entry level skills training and access to work. The Amber Trust was founded in 1995 to help blind and partially sighted children across the UK, who have a talent or love for music. We believe that visual impairment and other disabilities should not prevent children and young people accessing appropriate musical opportunities. Many families in the UK who care for one of the 25,000 children with little or no sight, live in relative poverty and cannot afford to give them the musical experiences that can transform their lives. The Amber Trust provides grants to these children for music lessons, music therapy, instruments, equipment and concert tickets. For some children, learning to play an instrument or to sing can add immeasurably to their lives. For others, many of whom have severe learning difficulties, music therapy may offer a lifeline. With the right encouragement, these children can develop their talents to remarkable ends, breaking down barriers, promoting social inclusion and helping to fulfil their potential as individuals and musicians. The Amber Trust works with other charities to raise awareness of the special value of music for these visually impaired children. We fund research into the impact of music and develop materials to help support the musical development of children. Through research, we know that music has the power to influence change in so many aspects of a child’s life: change that can last a lifetime. Our new international charity for 2018 is Water Harvest. Water Harvest works with rural communities in India to harvest the monsoon rains, enabling the poorest people to reap the benefits of safer and sustainable water. We are keen to encourage charities, particularly those who are locally based, to take a stall on the Sunday of Green Days. This is a great opportunity to share information about your charity, raise some funds and perhaps recruit some volunteers. If you are interested in applying for a stall please contact Heather White at ppcemail@virginmedia.com.